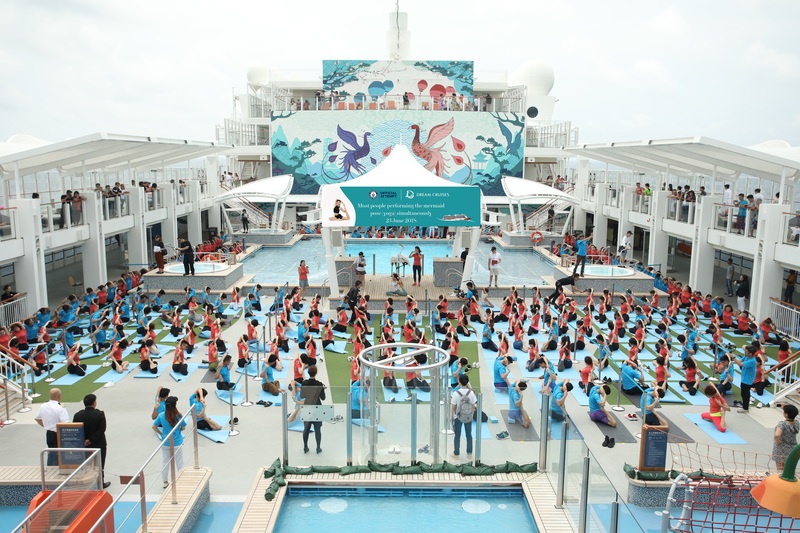 Hong Kong, 2018-Jun-28 — /Travel PR News/ — Dream Cruises has successfully set a brand-new Guinness World Record on 23 June 2018, where a total of 269 yoga enthusiasts gathered aboard World Dream to perform the Mermaid Yoga Pose simultaneously; led by Ms. Stefanie Ngai, Asana World Champion 2013, the group had successfully remained in the pose for one full minute and set the brand-new Guinness World Record for Most People Doing the Mermaid Yoga Pose Simultaneously. 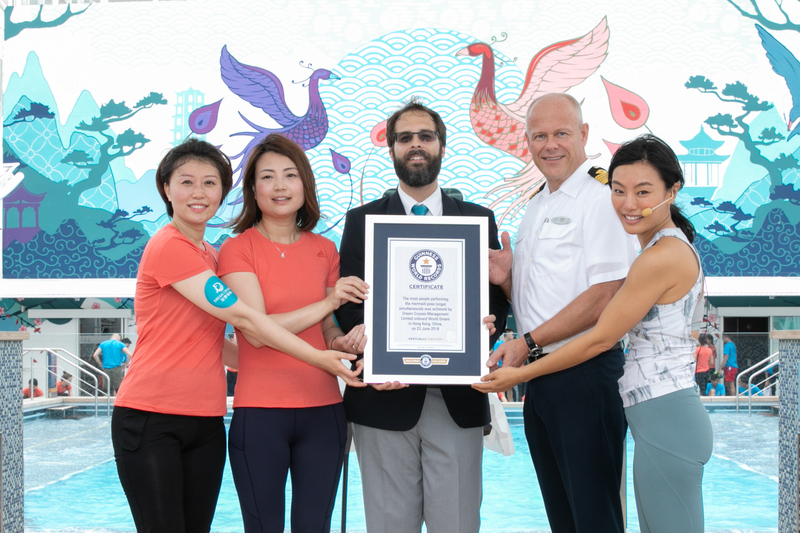 This is the second Guinness World Record set by Dream Cruises, the first one being the world’s largest LEGO® ship, set on 15 November 2017. (From left to right) Ms. Ann Zhang, Hotel Director of World Dream; Ms. Christine Li, Senior Vice President & Head of Marketing of Dream Cruises; Mr. Louis Mr. Louis Jelinek, Adjudicator – Greater China of Guinness World Records Ltd.; Captain Jukka Silvennoinen of World Dream and Ms. Stefanie Ngai, Asana World Champion 2013. Dynamic Flow Yoga is a series of yoga asanas choreographed into a dynamic flow for progressive yoga practice. It combines asanas with breathing techniques to create internal rhythm to the body. Practicing yoga asanas can improve body postures and enhance body flexibility. Hatha Yoga is composed of a series of simple and effective yoga poses in standing, forward-bending, back-bending and twisting to achieve a balance of body and mind relaxation. Specially designed for body restoration and relaxation, this selection of yoga stretching poses is designed to bring comfort to body parts and to gradually restore the entire body. Muscular imbalances such as over-loosening and over-tightening of muscles can lead to instability of joints. Supplemented with tools tailored for myofascial release, this series of exercises can help loosen tightened muscles and restore joint stability for pain relief. 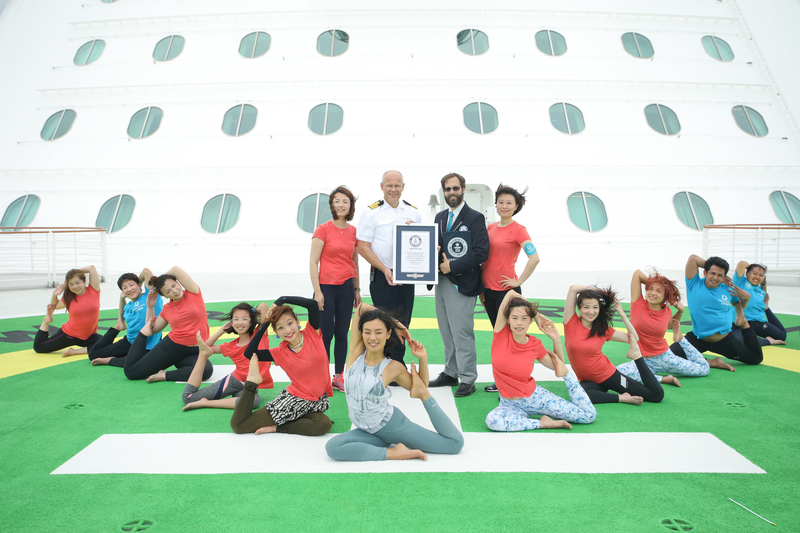 This entry was posted in Cruises, Holidays, Short Breaks, SPAs & Wellness, Sports, Tourism, Travel, Travelers, Trips, Vacations and tagged Cruises, Dream Cruises, Guinness World Record, Hatha Yoga, MERMAID YOGA POSE, Restore Yoga, World Dream, yoga. Bookmark the permalink.